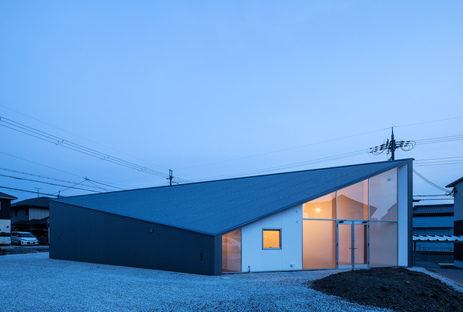 Kyoto Alphaville designed Skyhole, a studio/home for a painter, a designer and their son in Japan’s Shiga prefecture. 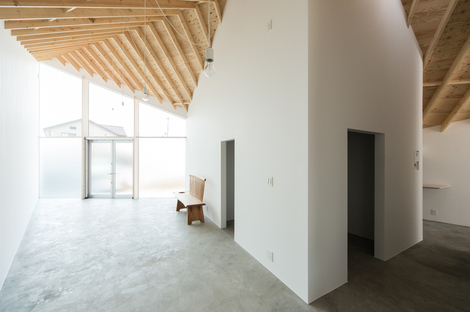 In Skyhole, Alphaville focuses on reconciliation of work and home in a single interior. 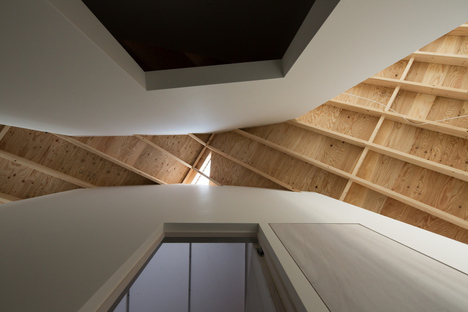 Skyhole is the term Alphaville of Kyoto uses to describe the results of its study of the home, leading to construction of an urban home and studio in Japan’s Shiga prefecture. The architects of Alphaville rose to prominence a couple of years earlier for their Guesthouse in Koyasan, a small construction with forms inspired by local farmhouses and an interior designed to make the most of the available space in both common areas and bedrooms. 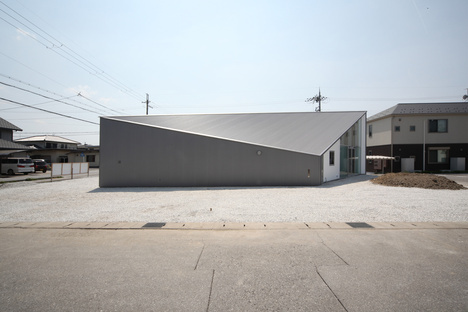 Reconciliation defined as a well-thought-out combination of public, semi-public and private space, often minimal, is an area of much interest to Japanese architects. 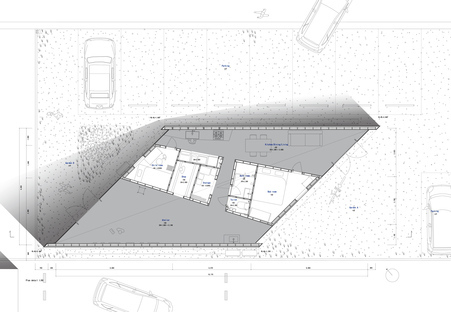 Looking at the layout of the Skyhole, we can see that here too it was literally necessary to squeeze the building into a lot surrounded by parking lots on two sides and public streets on the other two. 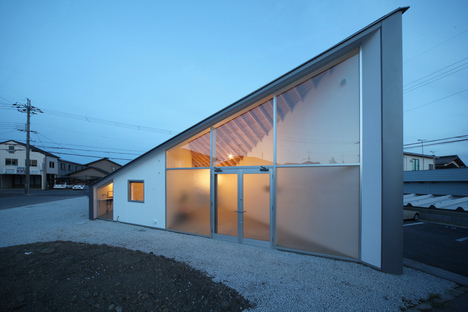 What is immediately striking about the project is the shape of the building’s layout, a parallelogram, explained by the need to extend the available living space beyond the classic rectangular floor plan to the north and south, where the only windows in the building are located; with the exception of a roofline skylight, there are no other windows or doors to the outside. 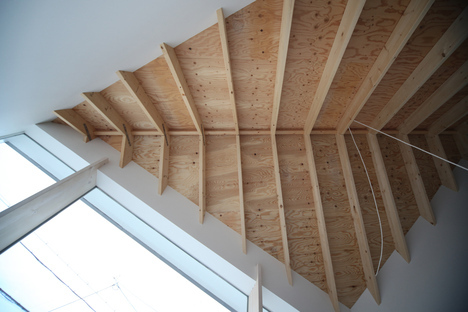 Light is a very important element in this experimental home reconciling work with private use of space. 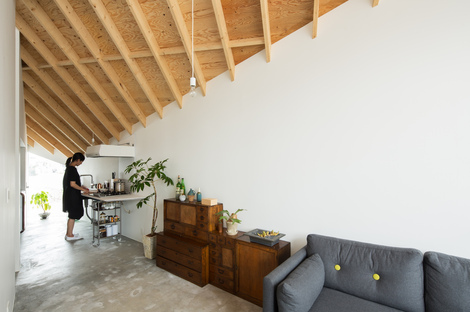 Inclusion of workspace in the home is unusual among the Japanese, who think of the home primarily as a protective shell, a compact, introverted place; it is unusual for the Japanese to open up their homes to the outside world. 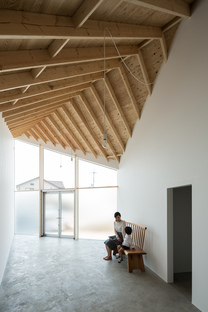 In this case, the clients, an artist and a designer with one child, did not want to separate their time together from their time working on their artistic, conceptual and practical experiments; they wanted their home to be a place to spend the whole day with their only child, while at the same time exhibiting their work as if in a gallery, where the public could come in at any time and where events could be held. 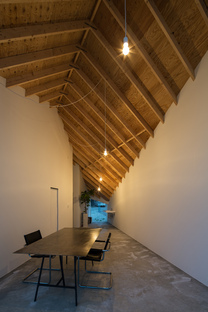 Alphaville did not create mobile boundaries for changing the sizes and proportions of space to suit different situations, but defined permanent walls with flexible perspectives, responding to both uses, multidimensional spaces with functions which are somewhat imprecise as they are constantly changing. 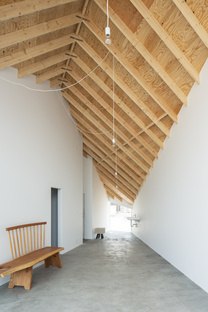 Distortion of the volume is clearly a “vibrant” metaphor with which to express this concept. 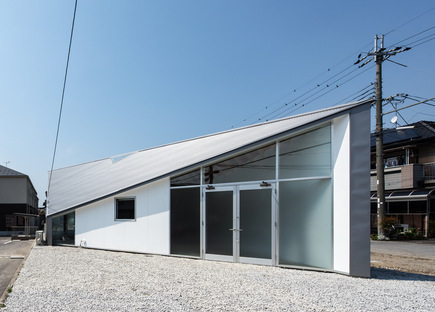 The process diagram illustrating Alphaville’s project is very interesting: starting with an ordinary gabled roof, the gables are folded like origami to create the long walls and glass infill. 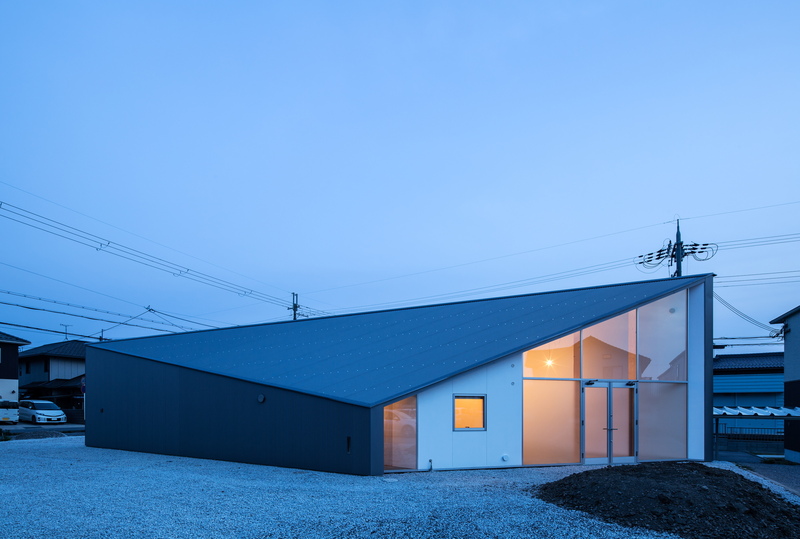 In addition to the considerations already expressed regarding the introspective nature of the Japanese home, climate is a factor, as Shiga prefecture has harsh winters with strong winds and plenty of snow, another reason to limit the openings to the northern and southern walls alone. 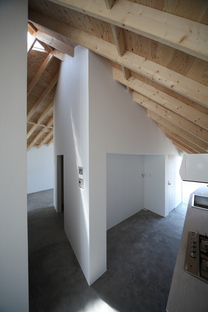 Inside, the shared space is divided into two parts by a diagonal volume containing the spaces characteristic of a home and essential even in the presence of such total flexibility: the adults’ bedroom, the child’s room and the bathrooms, with separate toilet and bathing areas according to the Japanese custom. 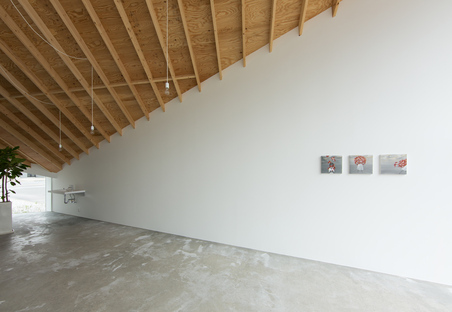 But even this dividing volume is designed to open up onto the work area, containing storage spaces for artworks and a sales area, so that these spaces can also be put to use for hosting events. 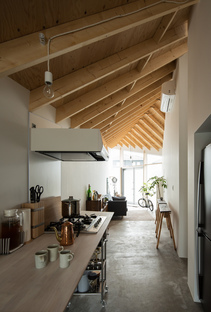 The studio space receives plenty of indirect light from the north and is located at the highest point of the roof, while the living area emerges out of the opposite side and receives light from the south. 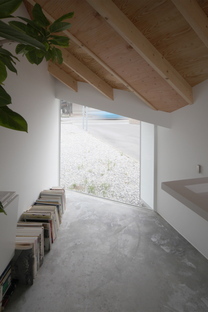 Small openings in the opposite walls ensure that light always comes from two different directions. 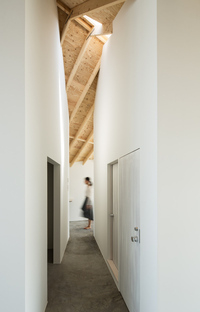 The two rooms communicate via a corridor created in the central volume and used during parties. 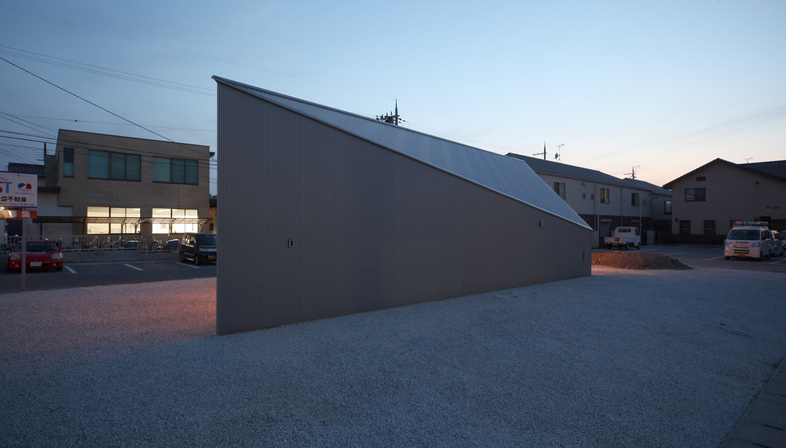 The diagonal walls thus created act in synergy with the roof at different slopes to create unusual perspectives which are never boring, in art or in life.